After fielding many calls asking about furniture accessories, we are proud to offer Ipe tables and chairs. We have the nicest Ipe furniture in the US. Our Ipe furniture is finely crafted and will provide you wonderful enjoyment for many years. Below are the various chairs, tables, and loungers available. Call with your list and we will custom quote delivery to help insure the best price to you. 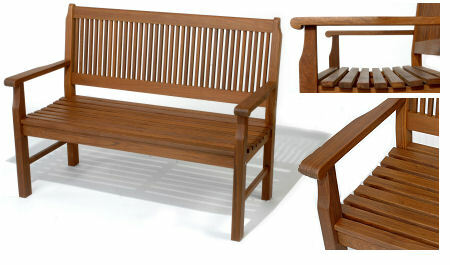 The Ipe Park Bench is solid, durable, and easy maintenance. Just like your Ipe Deck. This Timeless Ipe Design is what you would see in a turn of the Century garden. You or your guests will enjoy this beautiful Ipe accessory. 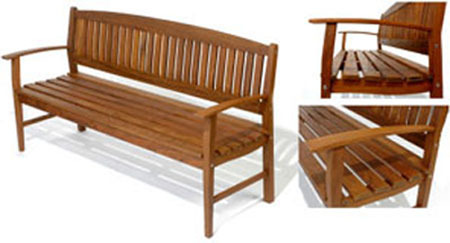 The Ipe Park Bench comes in three widths to meet your specific needs. 4′ Bench: 52″W x 25″D x 39″H – 84 lbs. 5′ Bench: 64″W x 25″D x 39″H – 104 lbs. 6′ Bench: 76″W x 25″D x 39″H – 134 lbs. The perfect compliment to your Ipe Deck. This is just the bench you need as it will sit comfortably your guests as they are wiling away the hours. The bench is gently curved for comfortable sitting.This is not the deacon benches of years past. This is the lounger for the World Traveler. Just like you see on the “Sun Deck” of the Love Boat, this lounger combines the durability of Ipe with old world charm. 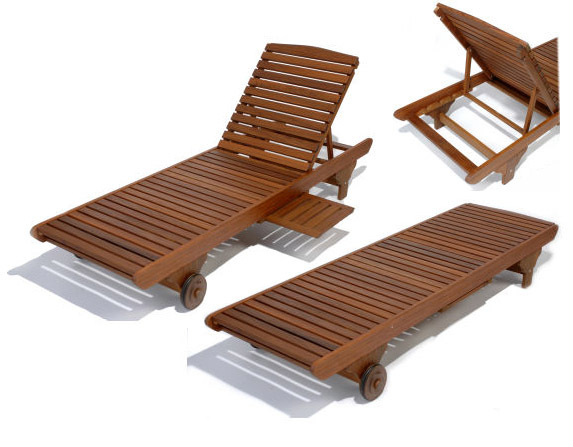 The Ipe Lounger has 4 levels of recline and wheels for easy movement to catch some rays. In addition, it has a pull out tray so you do not have to bother Isaac for a drink. The Ipe Oasis Sun Lounger is perfect for poolside. Made from Ipe wood. No preservatives are needed to maintain your furniture. It will weather naturally to a warm silver-grey patina. If you desire to maintain a rich natural brown color, occasionally apply a finishing oil. Another Ocean Liner Classic. The Ipe Steamer is perfect for relaxing. It can be placed in any position for perfect comfort. That is not two chairs below but one. The detachable footrest allows evern more flexibility when it comes to your comfort. The Ipe Steamer has 4 reclining positions. The Hardware is Stainless Steel to insure that it will last as long as the Ipe. The Stainless also complements the beautifuly rich grain and color of the Ipe wood. This is unique in the world of Ipe Furniture. This coffee table has a frame around the outer edge. The inside slats are perfect complement. For gathering round with friends or just to place a few drinks on this table is perfect. Classic Design, solid and durable the Time Honored Chairs are a must to consider in your home and deck. These chairs are equally at home on a deck, in a lobby, in a family room or game room. They are even rugged enough for commercial use. Not just strong, note the gently curved seating and backs. These chairs are comfortable too. What do you do when your party is bigger than your home. Move it out to your Ipe Deck and pull out some folding chairs. Of course, not just any folding chairs but Ipe Folding Chairs! Perfect for the deck or garden our Folding Chairs have style and elegance. As ipe last effectively forever you will notice most of our furniture is of classic design. The same is true for our Folding Arm Chairs. Our Folding Arm Chairs are sleek with lots of curves. When folded they can be stacked together for extra space savings. However, when open you would be hard pressed to say these are not real chairs. These are not the rickety TV Table staples of our youth. These are quality chairs that will last for a long time. With Arms: 17″W x 16″D x 38″H – 20 lbs. Without Arms: 17″W x 13″D x 38″H – 19 lbs. Talk about a classic. 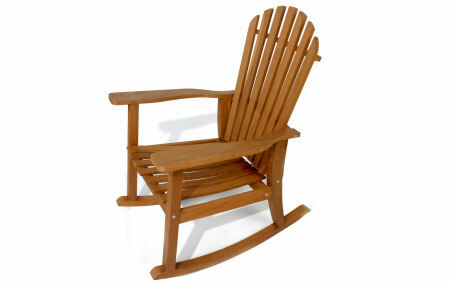 Our Ipe Adirondack Rocker is just what you would expect on an Ipe Porch. Rock away the day enjoying a refreshing breeze in your wonderful rocking chair. Again, this is not your grandad’s rocker. The traditional design has been improved. The seat is curved and the high back is supportive. This ipe rocker is more comfortable than any you sat in as a kid. Like all our Ipe furniture, it will turn gray over time but not crack or splinter. If you do desire to keep the warm brown Ipe color than a simple periodic application of a finisher will do the job. Dimensions: 19″W x 21″D x 44″H 48 lbs. All our Ipe Furniture is built upon classic lines. As Ipe will outlast most people, we purposely chose not to build a style that will be hot this year but turn to avocado green kitchen. All ipe will turn gray. If you wish to maintain the warm Ipe brown color all it takes is periodic applications of finishing oil. Call for latest pricing. Please allow approximately 2 to 3 weeks for delivery.